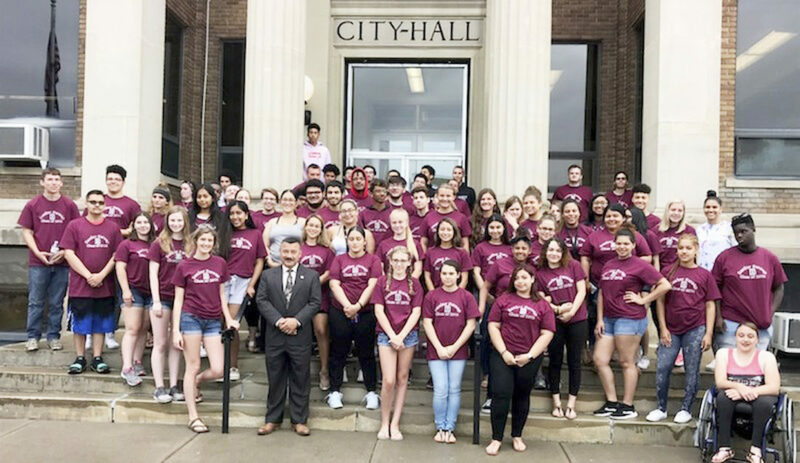 Submitted Photo The Dunkirk Class of 2018 stands outside City Hall with Mayor Willie Rosas. Approximately 70 students from the senior class participated in the cleanup of debris and trash around the city. The 2018 Senior Sweep was held on Wednesday, June 20th with approximately 70 students from the DHS Class of 2018 participating. “This event is one that I always look forward to hosting.” Mayor Wilfred Rosas said. “To see our young people get involved and show pride in the appearance of the City is what community spirit is all about.” He said. The students went through several neighborhoods picking up trash and debris before returning to City Hall for pizza with the Mayor and members of the administrative staff. “My special thanks go to our Recreation and Youth Director Ryan Hall, Deputy Director of Planning & Development E.J. Hayes, DHS Advisors Miriam Lugo-Alfaro, Michelle Gilmour and Kim Delgado for organizing this year’s event.” Mayor Rosas Said. Congratulations to all of our graduating seniors!